We’re on the 2nd floor in a house of unknown ownership, lounging on pillows laying on the floor against a long, bare white wall; a wall that is chipped and marked, a carpet of indeterminate shades. On either side of this open space, moody grey skies slowly succumb to the darkness of the night through big steel-framed windows. Streaky white curtains billow listlessly in the breeze, blowing the passing minutes into a lost and far-away land. Every now and again strangers drift up the staircase, lean against the banister, maybe a quick nod in our direction, more often than not, eyes downcast and intent on their pursuit. Here we spend endless hours in the numbing haze of fragrant smoke, seekers of a common distraction, a wordless companionship of inane conversations and missing moments. An hour passed, or it could have been a day, for time doesn’t live in this house. Stay forever we could not, and soon we found ourselves walking deserted, nameless streets in a comfortable stillness as the first rays of sunlight played warmly on our backs. The take-away coffee and toasted sandwich could have been a lavish meal from a royal banquet in this fresh and silent dawn. And still we kept on walking. ‘Till the twittering birds were pushed into the distance by the sound of rushing water from somewhere to the north. It seemed like a good idea to head that way, maybe find a way closer to the river bank and just sit and watch for a while… We found the disused road that led us to an old arch bridge where grass and weeds have broken through the old cement surface. But it was solid, and it had a stone railing alongside the pedestrian walkway, aged and weathered and covered in moss in places. Surefooted and with lightness of step you playfully leapt on this low railing, turned and grinned at me, while you took in the elevated view. With an exaggerated bow and extended hand you turned my way again, but your foot found the moss, and your footing was lost, and you disappeared towards a foreign below. Time flashed by as I raced to the spot where your ghost still stood, confusion on your face, staring down at the cement slabs of the riverbed below, where your body lay inert and lifeless. It was over before it began, before help arrived, and chaos replaced the peaceful kiss of dawn. 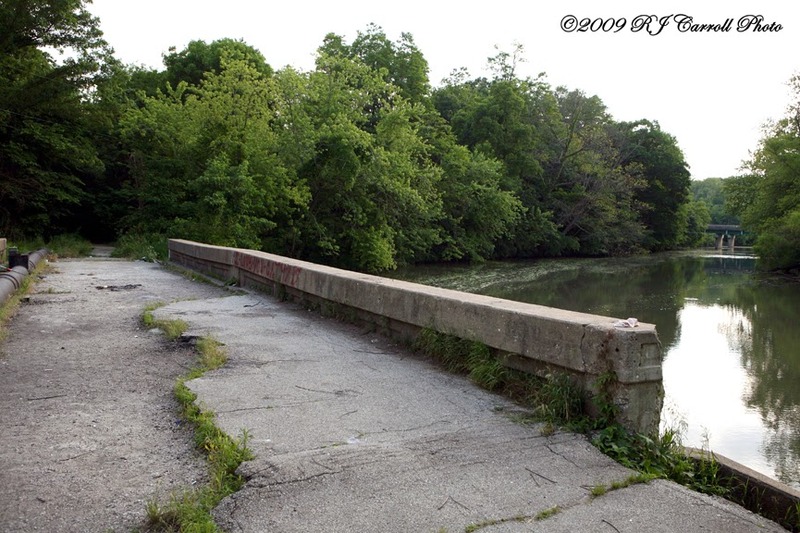 I stood there long after a stunned silence returned to this abandoned bridge. Your ghost and I. Unable to comprehend, unwilling to accept, incapable of letting go. And we left hand in hand, a wordless companionship in the reluctant silence, away from this place of dismay.